PXC CEO and Promoter, EJ Calvo, confirms that one of Japan’s outstanding fighters and the Shooto Pacific Rim Middleweight Champion, Keita “K-Taro” Nakamura, is the latest addition to the stacked PXC lightweight division. Nakamura brings with him an exceptional 25 wins with only 5 defeats and 2 draws. He is a talented fighter who can finish fights on the ground or on the feet. He is widely considered as one of the baddest men in Japan, as he holds an impressive wins over Nobutatsu Suzuki, Yasubey Enomoto, Yoshiyuki Yoshida, and Daisuke Nakamura. Unlike other MMA fighters who started learning martial arts in their early age, the former Sengoku welterweight champion learned his first martial arts at the age of 18. Though started late, he catch up pretty quick as after a year of learning martial arts, he already made his first-ever pro MMA fight and dismantled his opponent in just 33 seconds of the first round. The UFC vet Nakamura is a promising fighter who is a legit threat to anyone in the PXC lightweight division including the current champion, Harris “The Hitman” Sarmiento. I personally would love to see Nakamura make his PXC debut against a fighter who is equally as talented as he is in the likes of Frank Camacho Hong Seung Chan or Isaiah Ordiz. There has been a several of world-class fighters joining the PXC in the past few weeks.The Guam-based MMA promotion first announced that the heavy-handed Frank “The Crank” Camacho re-signs with them. They’ve also proclaimed PXC that they inked a deal with Japanese wrecking machine, Masanori Kanehara, a very exciting fighter who has a notable wins over Michihiro Omigawa, Nirofumi Yamamoto and “The Korean Zombie” Chan Sung Jung. Then, another destructive fighter joins their always-exciting bantamweight roster as former KOTC flyweight champ Frank Baca looks to become a legit threat into one of the most exciting weight classes in the PXC. Be sure to visit http://www.pxc.com.ph or Like their official Facebook page. With the recent conclusion of the Team Lakay 13th Grappler’s Cup which was held last June 12, 2013, one of the most important day in Filipino history because we celebrated the Independence Day of our great country. We can say that it has been successful for the fact that different gyms, including those from as far as Cavite and La Union, participated in the said event. We also had the venue on a different atmosphere letting the participants have a different experience since we had it held at a roof top of one of the buildings in Pine Valley Plaza, La Trinidad, Benguet. Being different from our usual venues like school gymnasiums and beach resorts, we had it held at such venue to establish a high-altitude competition. However, it is one of the goals of Team Lakay to rotate the locations of its Grappler’s Cup competitions to let the participants experience different kinds of environment. Having organized 13 Grappler’s Cups already, it has established Team Lakay as organizer of such events and it is our vision to continue promoting it for the development of the ground game of our fighters and members, as well as the other participants from different gyms all around Cordilleras and different parts of the Philippines, as it is getting bigger and bigger. It is also the goal of Team Lakay in organizing these kind of programs to put on a stage for them to expose themselves to more competitions before they get to compete in bigger and tougher events. But what is grappling by the way? Grappling refers to techniques, movements, and counters applied to an opponent in order to gain a physical advantage, such as takedowns, proper positioning, mounting, submitting or locking, escaping, and controlling your opponent. However, grappling does not include striking. Grappling is a technique which has been developed even in the earlier times of our history. I will not discuss here the history of Grappling or Jiu Jitsu and Wrestling, but to give you a brief background of how it went to where it is right now. In our local region, when we were kids, we used to play what we call “Ginnabbo”, the local term for judo and wrestling. The Kankana-eys call it “Damá”, while the Ifugaos call it “Bultong”. This type of sport has already been here in our place even before we were born. It was a type of recreation for our forefathers. I even experienced it playing “Ginnabbo” on the wide, vacant grassland near our home. Like that of playing the kite and hide and seek, we played “kinnudtar” or kicking each other, “innubba” or carrying another on one’s back as a team while kicking or striking other opponents. Nowadays, I don’t think a lot of the children have experienced this; all they experience now is that if they want to play wresting, they have to go to the gym to practice this sport. For us it was not even a sport, it was a form of recreation. But with the development of the sport in other countries especially in Japan, Brazil, UAE and in the United States of America, the techniques have become more formalized and improved. There are a lot of techniques that you have to master before getting into this kind of sport and eventually join in competitions. Now, I would like also to dedicate this piece to our national hero , Dr. Jose Rizal, in memory of his birthday on the 19th of June. He was also a martial arts practitioner and being a martial artist himself, he had known how to properly use the disciplines he knew in proper and peaceful manner. This is one great character that I’ve liked about him, aside from being intelligent and talented; he had not made use of his knowledge of martial arts to form a revolution. Even having been knowledgeable in different disciplines such as judo, wrestling, arnis, fencing, shooting and others, he had not used this to gain independence from our invaders. He still managed to put into writing all his thoughts to gain independence in a peaceful manner. But if needed to apply what he knew, he will do it. That is martial arts; it is only applied when it is needed, like self-defense and during healthy competitions. Martial Arts are not supposed to be used to start a physical encounter and street fights; or to show to anyone that he is strong and powerful; or to intimidate or bully others. Instead, we should use this art to settle disputes and misunderstandings in a peaceful way- like what it was used to be. It has been embraced by law enforcement officials worldwide and continues to be the foundation for many specialized system used by police especially in countries like Japan. This is the way of martial arts. But nowadays, aside from bringing peace it also is a form of entertainment, a way of disciplining one’s self, and a way of bringing honor and pride to one’s country by representing his or her country in international competitions. This is what we intend to achieve, to bring peace to our countrymen, by becoming ambassadors of peace, as well as to give honor and pride to our country and family. This is what we do, this is who we are. Frank “The Crank” Camacho Returns To PXC! “THE CRANK” PREPARES TO SMASH PXC’S LIGHTWEIGHT DIVISION! PXC recently signed Frank Camacho (10-2), a focused young MMA fighter and TUF Alumni, and will be announcing his return to the PXC cage after a 6 year haidus while residing and training in the US mainland over the last 4 years. Camacho is one of the top prospects in the Pacific MMA scene, and at the ripe age of 24, the best years of his MMA career are in front of him. Frank Camacho was born in Guam and raised on the island of Saipan in the US Commonwealth of the Northern Mariana Islands, where he made a name for himself as a golfing talent by the age of 5. He competed in the junior worlds at the age of 13 with a 1 handicap. 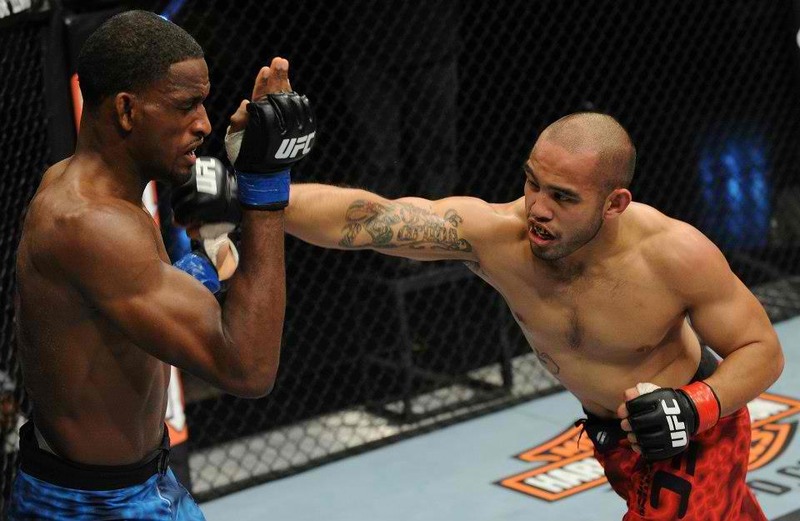 At the age of 14, Camacho decided to try MMA and BJJ training and was hooked, fighting his first professional cage fight in Saipan at the age of 16. “The Crank” returned in PXC-13 four months later for a huge victory of Guam’s Ryan Bigler at 170 pounds. How do you feel about your PXC return? 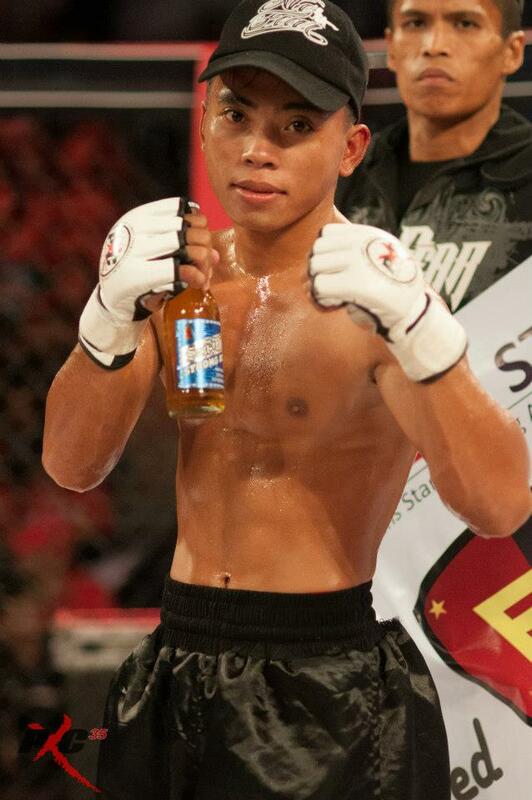 I am truly honored to be back in the PXC cage, especially making my comeback home in the Marianas fighting on Guam. Everyone knows I fight my hardest to represent the Marianas with my whole being, which makes it even sweeter to fight in front of fans that support me most. Everyone will see a new Frank “The Crank” Camacho. I just want to get back my mojo back with a win! Im back in the islands…back to my element…back to my roots. My short term goal is to patch up parts of my game that need attention right away…and eventually bring the PXC Lightweight belt back home as soon as possible. Long term goal is to be a modern day samurai. I want to be a better person every day. Martial arts has changed my life in ways I cannot explain, and if I can pass it on and inspire people, it would be a life-long success for me. visit pxc.com.ph for the latest updates! It was another disappointing night for Team Lakay last Saturday night at the ONE FC 9: Rise to Power. It was even worse than the last event that we had been to. Again, we went home frustrated, disappointed, dismayed and heart-broken. We lost, not just one but all of our fights. But as for me and our team, we thought some of our fighters should have won that night. At least we should have made our supporters proud, even if we did not win it all, we should have won some, especially if it was clear that we really deserve those wins. We thought that we disappointed the whole country. We apologize to the people who believed in us for not getting the wins. But we thank them for being there to support us. However, this is not the end of everything, instead, it is just the beginning. The start of a new chapter of our lives as a team and as fighters. We were tested as to up to what point we are capable of. We are considered as the best in the country, these fighters are the best among the best and yet these happened. Questions arise in our mind and some answers came up too. A lot of facts were given, but one thing is for sure, that the Philippine MMA is still young compared to other countries especially Japan. Japan has been in the fight business for so many years. When the UFC held its first event on November of 1993 in the U.S, Japan back in that year have already doing a lot of local MMA shows. In other words, before UFC, Bellator, Strikeforce, ONE FC, URCC and PXC came into the scene, Japanese MMA is already having a blast. In my opinion, Japan, it is even where MMA was born, it is where some of the greatest MMA fighters made their name, and it is where the greatest in MMA memories were captured. Now, as the western MMA came, it’s when the downfall of Asian MMA happened, or maybe not the downfall, but the decline due to some conflicts with the organizers, the politics inside it and the increase of even more innovations from other minds who are engaged in this kind of business. Nevertheless, MMA in Asia, especially in Japan has not died, it was always there, it was just there, while others are so intense in the promotion and in their popularity, Japan never stopped producing some of the best fighters in the world. The younger generations of fighters from Japan were students, sons and, children of the greatest fighters and teachers of MMA or Martial Arts in their country. With the evolution of techniques and other disciplines, they kept their young ones in Martial Arts schools, aside from bringing them in regular educational schools. Now the Philippines has reached a point of another chapter; the realization of where we are at right now. Our assessment? Philippine MMA is still so young. Of course we see a lot of MMA gyms popping out right now all over the country. But we have to develop well-rounded gyms, camps and teams. After the event, many saw our weaknesses; everybody became experts in this field by saying a lot of things. We had our game plans; we went to the event without the so called “zero-knowledge” in grappling, take-downs, or wrestling. Yes these are our weaknesses, but we can’t say that we don’t have knowledge about it. Experts can be the one to attest to that, they are the ones who can see what we lack. And yes, we admit and accept that we still have a lot to improve. But these are the best, so what’s good here is that it is not only us who learned from this experience. Other gyms and teams should also learn from these. In order to be the best, you have to beat the best. And as they say, you are not called to be a great fighter if you have not fought the best. You can never learn your weaknesses unless you have not dealt with the strongest. The bottom line is we are still young and the best is yet to come. Give us more time and you will see the best in us yet. As I always say, these experiences are all lessons to learn from. Like in life, as we grow older, we become wiser, we become better, we become what we intend to be, especially if we are willing to learn and apply these lessons in order to reach whatever our ultimate goal is. These are all part of the game-winning, losing, criticisms, praises, challenges, laughter, tears, pain and relief. Without these, fighting is nothing. The most important thing is that we strive to become better in every experience that we have until we achieve excellence. We don’t claim perfection; we’d rather go for excellence. We would like to thank the following for supporting and assisting us during the ONE FC: Rise to Power event: Havokk Clothing Company, Hayabusa Philippines, Head Hunting Heritage, Tiong San Department Store, Calajo Restaurant, Catering and Bakery, 50’s Diner, Tatak Maharlikano, Jun and Rosy Car Sales, Vicious Circle, Goshen Land, Atty. Dante Bagsan, Dr. Dave Taclobao, Arch. Lehman Cosalan, Gov. Nestor Fongwan, Cong, Teddy Baguilat, Jr., Jone Lapicto, Patrick Mariano, Marlyn Tafaleng, Jethro Chungalao, Ariel Corpuz, Franklin Pagnas, Cacay Baltazar, our trainers, training partners and all the others who had been there with us before, during and after the fights. On behalf of the team, I would like to thank all our supporters, families, relatives and friends for believing in us and for being with us all throughout. Most of all To God Be the Glory and Praises. Team Lakay will rise again Better and Stronger! Matago tago tako am-in. Mabuhay tayong lahat! Brandy is former MMA practitioner himself, a father of two lovely girls and a very considerate coach to his pupils. Quiocho started training BJJ with fast-rising MMA lightweight prospect, Isaiah “Ice” Ordiz and Manny Jimenez. He and his buddies at first, tried some BJJ tourneys, until one day, he found himself in front of a computer searching muay thai techniques through YouTube. Brandy really researched everything from the basics of Thai boxing, from how to properly hold the mitts to other basic things that a beginner should learn in the awesome sport of muay thai. Of course, with the help of Ordiz, Brandy integrated their grappling skills with their newly acquired Thai boxing expertise. 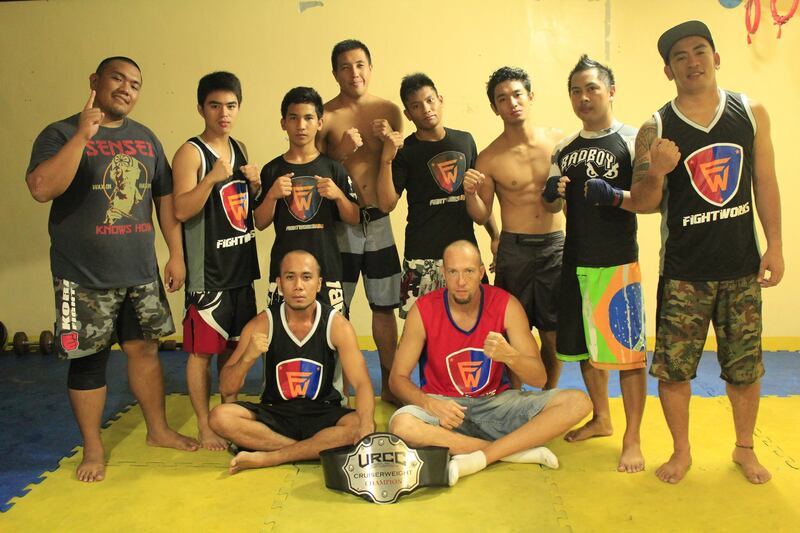 After honing their striking and ground skills, they entered in several amateur MMA competitions until they met the URCC Cruiserweight champion, Pete “The Professor” Brooks, who helped them with a lot of things that are related to training MMA. Being a head coach and a gym owner at the same time is very difficult, especially when you don’t have enough resources to sustain other expenses that might occur in the future and no one would like to support your fighters whenever they have an up coming fight. But despite of the hardships, Brandy, still, persisted and continued to train young fighters in San Pedro, Laguna, because he knows that changing someone’s perspective in life through martial arts is priceless. Francis Gajita and Jhayson Alcantara. Filipino-American Featherweight phenom continues his journey to be one of Asia’s finest MMA fighters as he is now the newest endorser of arguably the most famous footwear for athletes today, Vibram FiveFingers Philippines. 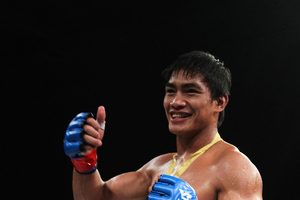 Boasting a 12-0 (10 via submissions and 2 via decisions) in his pro MMA record, Striegl is undoubtedly one of the best MMA fighters Philippines has ever produced. 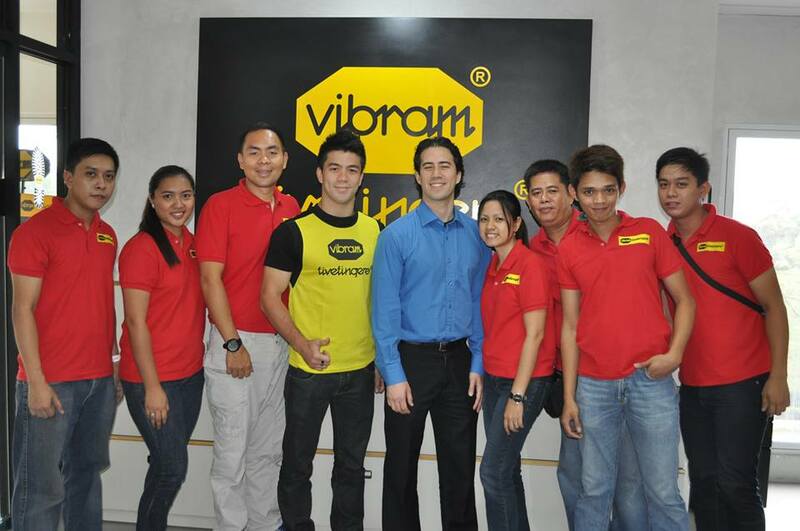 Striegl is the first-ever Filipino fighter to be sponsored by Vibram FiveFingers Philippines. 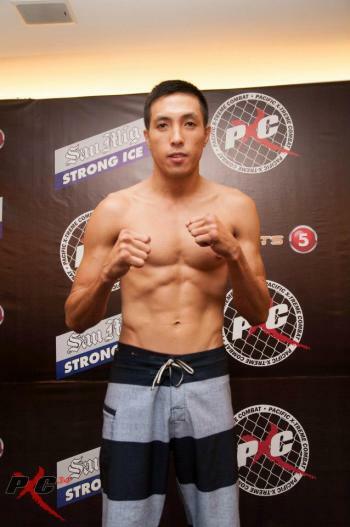 Striegl is currently signed under Pacific X-treme Combat (PXC) and will make his third PXC appearance in August against Japanese MMA vet Takumi Nakayama, who successfully made his PXC debut against tough Hawaii fighter, Jonny Pecyna. 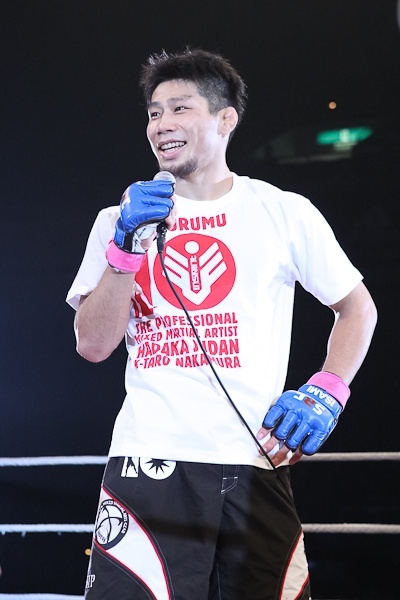 Striegl and Nakayama will be the second round of the PXC’s four-man featherweight tournament. The first round was held last weekend at PXC 37 between Jang Yong Kim of South Korea versus Hawaii’s Nate Thorell. Kim submitted Thorell by way of first round submission victory (kimura) and catapults himself into the tournament finals and waiting for the winner between Nakayama and Striegl. With big names such as Shinya Aoki, Eduard Folayang, Eddie Ng, Kotetsu Boku, Zorobabel Moreira, Peter Davis, and Lowen Tynanes, One FC’s lightweight division arguably the most stacked and exciting weight class in any Asian MMA promotion today. With the continuous admiration of fight fans around the world, One Fighting Championship keeps on signing world-class talents who can be their biggest assets in years to come. 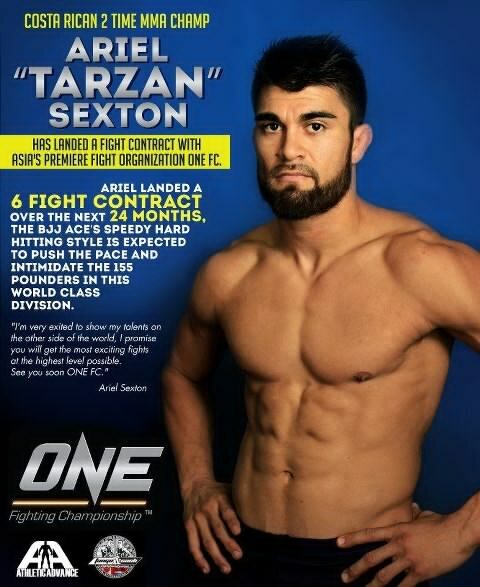 The latest addition to the ultra-talented One FC lightweight division is the Canadian-Costa Rican submissinon specialist, Ariel “Tarzan” Sexton (7-2-1). Sexton is part Canadian and part Costa Rican. He was born and raised in Vancouver Canada and at 20 years old, he moved to Costa Rica. He is a BJJ black belt under the tutelage Ryan, Renzo and Daniel of the Gracie family. His first teacher was Mauro Sergio, a BJJ black belt from Ryan Gracie. The Canadia-Costa Rican fighter loves all types of sports and martial arts. He is currently training at his own gym in Costa Rica at Athletic Advance. He is an MMA veteran who fought all over the world in many organizations and has won a few titles in MMA and BJJ, and he was also part of UFC’s reality show, TUF season 12. I don’t know if how many fighters in the fight business today has the coolest nicknames, but Ariel Sexton in my opinion has one of the most unique moniker in the industry. He is called “Tarzan” whenever he is inside the cage. “My nickname is “Tarzan” because when I first came to Costa Rica, I was to visit my family and stay for two months. Then that turned into 2 years without even going home. Obviously, it was because I found BJJ and wanted to stay. My friends in Canada think we live in trees in the jungle and were bugging me and said I’m like Tarzan..It stuck, plus I’m the king of the jungle.” Ariel said. With “Tarzan” being the latest addition to the stacked One FC lightweight division, he is for sure, one of those fighters who fans are interested to see inside the cage as he comes from a good BJJ background. He is very thankful and pumped for the opportunity to fight in Asia’s biggest MMA promotion. Sexton has a six-fight deal with One FC. The lightweight prodigy from Costa Rica looks to make his debut against one of Asia’s rising prospect, Peter Davis on June 15th in associate organization and Malaysia’s biggest MMA league, MIMMA (Malaysian Invasion Mixed Martial Arts). Sexton has trained with the best people in the industry at some of the outstanding MMA gyms in the world. Though he started honing his skills under Renzo Gracie in New York, Sexton’s hunger to be a well-rounded fighter brought him to try visiting several gyms, who later helped him on becoming a deadly MMA fighter. Being a lightweight fighter fighting under the One FC brand, Sexton is aware that the current lightweight champion is a great fighter and one of the most feared fighters in the world today. He respect Aoki, but if he would get a chance to fight him, he’ll push the pace and shock the world. Costa Rican MMA fighters are not that really making huge buzz in the MMA world, except for Sexton, who is probably the most successful MMA fighter in Costa Rica today. But talent wise, there are a lot of skillful fighters down there. “MMA in Costa Rica is very big and has been around for about 10 years. We have the highest level in Central and Latin America. Our only problem is that we are shadowed by soccer and it is very hard to get sponsors and even recognition. We have fighters that are fighting in Europe, Canada, USA, all over Latin America and now in Asia. We are so talented that we only export so the world knows of Costa Rica.” Sexton said. “Expect from me in my One FC fights to push the pace, throw bombs, flying knees, always the fight of the night, hard ground and pound with jiu jitsu scramble ability that crowds love. Plus, I can talk great and I always love to be in front of the camera, a true showman that respects others and wishes the best to the One FC family. See you soon! 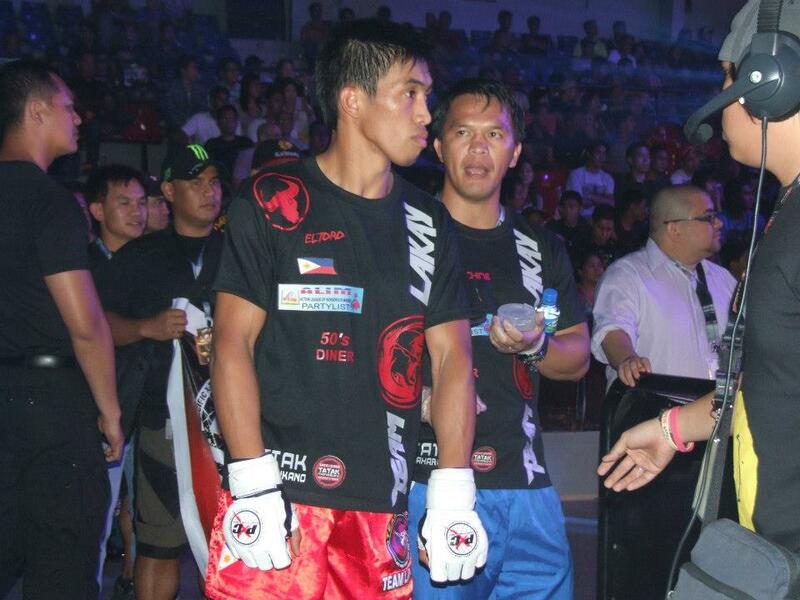 In the past few years, Team Lakay has been a major force in Asian MMA scene, especially in Philippine MMA. 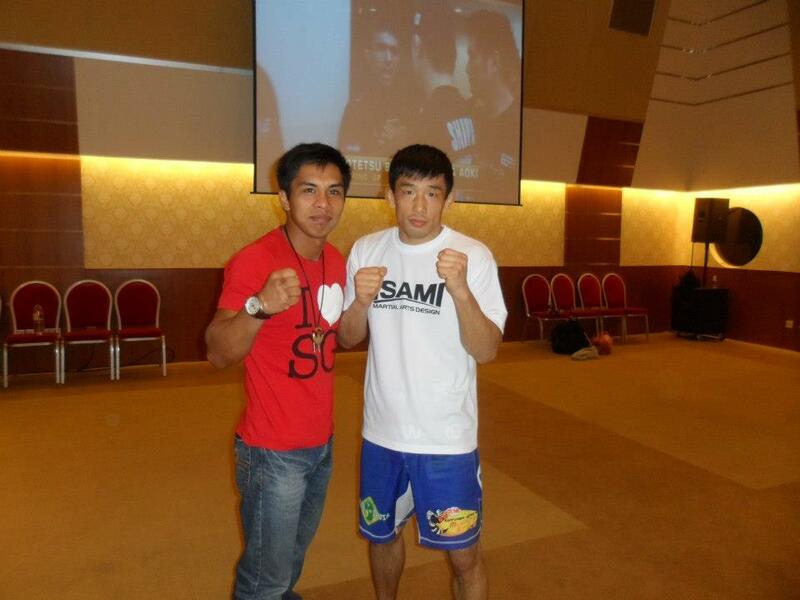 They are one of the reasons why Philippines is the hot bed for MMA in Asia today. Team Lakay is the home of MMA champs such as ONE FC featherweight world king Honorio “The Rock” Banario, who is also the current URCC lightweight title holder. 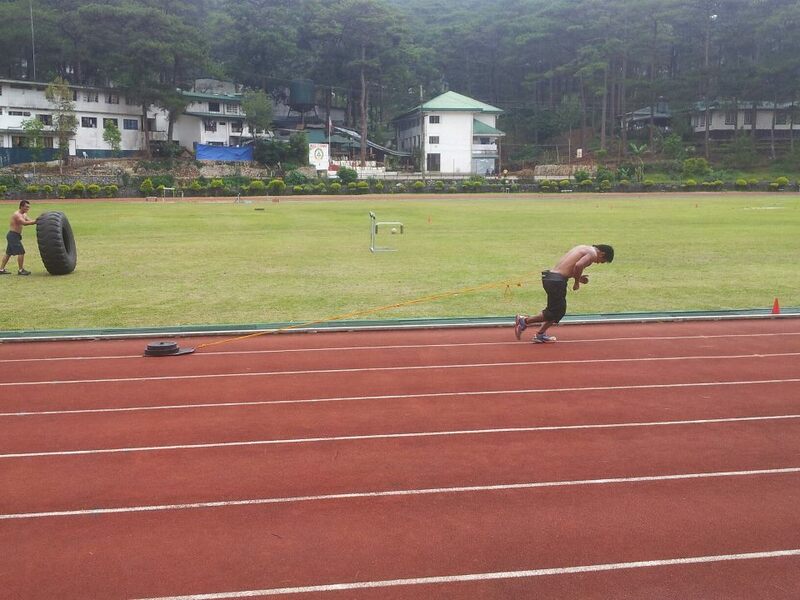 The Baguio-based MMA fight team is also the residence of PXC world bantamweight champion Crisanto “The Slugger” Pitpitunge, URCC welterweight champion and Martial Combat Superfight title holder, Eduard “Landslide” Folayang, URCC flyweight champion, Kevin “Silencer” Belingon and the longtime URCC flyweight title holder, “The Punisher” Rey Docyogen. If there is one man who is responsible for producing such great fighters, that would be none other than Team Lakay’s head coach, former URCC bantamweight champion, and former SEA Games Gold Medalist, Mark “The Machine” Sangiao. Sangiao is a long-established martial arts practitioner. From kickboxing to taekwondo, judo to Brazilian jiu jitsu, Sangiao is truly, the pioneer of MMA in his home town Baguio City and arguably one of the people who brought MMA in the Philippines into a whole new level. Sangiao knows how to build champions, he knows how exactly a fighter should train and eat because he is a former fighter himself; he understands the point of view of every fighter who trains at his gym. Team Lakay’s journey on top continues as they prepare for the biggest fights of their MMA careers. Mark Sangiao is getting his fighters ready for two of the most anticipated mixed martial arts events not only in the Philippines, but in whole Asia, as 8 of his best pupils will compete in PXC 37 and ONE FC 9 ‘Riste to Power’. Both events will be headlined by two Team Lakay world champions. First up, PXC 37, happening on May 18th at The Ynares Sports Arena in Pasig City, Philippines, as the current champion Crisanto “The Slugger” Pitpitunge makes his first-ever title defense against the undefeated and ground specialist from Japan, Michinori Tanaka. Also, two of Team Lakay’s young fighters, Troy “The Hunter” Bantiag and Jerome Wanawan will make their appearances at the said PXC event. Bantiag will go up against Guam’s Trevin Jones, while Jerome Wanawan looks to comeback to his winning ways against a very talented fighter from San Pedro, Laguna, Ernesto Montilla Jr.
After PXC 37, the mammoth ONE FC 9 ‘Rise to Power’ is up next for the Baguio-based fight team. The current ONE FC world featherweight champion from Team Lakay, Honorio “The Rock” Banario will also make his first title defense against a seasoned veteran in Koji Oishi of Japan. Four more well-recognized Team Lakay fighters will make their toughest fights so far as Eduard “Landslide” Folayang faces WEC and UFC vet, Kamal “Prince of Persia” Shalorous, Kevin “The Silencer” Belingon battles grappling wizard Masakatsu Ueda for the Bantamweight GP Finals, Rey “The Punisher” Docyogen takes on former UFC fighter, Yasuhiro Urushitani and “The Gravity” Geje Eustaquio is finally back inside the ONE FC cage against his toughest opponent to date, Phuket Top Team’s Andrew Leone. All of Team Lakay fighters that will compete at PXC 37 and ONE FC 9 are matched up against world-class grapplers. It is evident from their past fights that whenever a grappler fights a Lakay fighter, it is either that grappler’s going to give the Lakay fighter a tough fight or submit him. But as we all know, the game is continuously evolving so as the fighters. Lakay fighters, through their setbacks against ground specialists, gave them a serious motivation to train harder and focus more on sharpening their grappling skills. “Troy and Jerome also are doing great. They are very positive the whole training because they really want to win their fights. Another great thing about this camp is that everyone is helping each other to improve. They are forcing everyone to sharpen their skills and aim to level their skills up together. They will be ready on May 18th for PXC 37.” Sangiao added. After PXC 37, ONE FC 9 ‘Rise to Power’ is next as Honorio Banario defends his title against Oishi, Belingon battles Ueda for the GP finals, Docyogen faces former UFC fighter, Urushitani and Eustaquio to lock horns with Leone. Fresh off his TKO victor over Thanh Vu last April 5th in ONE FC 8, Belingon’s next assignment is to beat a fellow GP finalist, Masakatsu Ueda. “I am always saying about this to other coaches – we need to have healthy competitions among us. If we have events here in Baguio, they are welcome to join us. If they do have events in their own provinces, we are glad to join and help them. Let us just take away that traditional mentality of comparing each other’s abilities; we need to have a healthy competition. We need to learn from each other for the benefit of the sport. Here at Team Lakay, we are willing to invite them to join our events. We set aside our pride because we know that we also need the knowledge of Muay Thai practictioners, Wrestlers and Jiu Jitsu, for us to be a well-rounded.” Sangiao added.